Put this on the list of things I meant to bring up a month ago when I first learned of it. 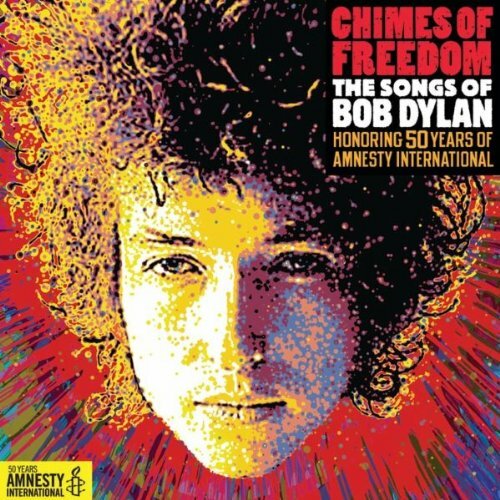 There's a new compilation out today called Chimes Of Freedom: The Songs Of Bob Dylan Honoring 50 Years of Amnesty International. As the title implies, this is a collection of Bob Dylan songs honoring and benefitting Amnesty. It's a 4-CD collection with 73 songs, 72 of them covers of Dylan songs by other artists with the 73rd and final song being Dylan performing the collection's title track. Bro. Mat Brewster unveiled a brand new series devoted to covers and began with a Dylan cover, one not on this set and as he mentioned, Dylan might be the most covered artist in pop music history. It's been done to death because the body of work is unassailable, even if every song from the Dylan songbook doesn't carry the epic weight of Shakespeare or The Old Testament. There have been some brilliant reinterpretations as with the most famous example, Jimi Hendrix's "All Along The Watchtower" and there have been duds best left forgotten. This isn't even the first Dylan covers collection as there are who knows how many tribute albums floating around out there, notably the soundtrack to the quasi-biopic I'm Not There. So, yes, this isn't a new idea but it is a new collection (although some of these recordings may have appeared elsewhere before becoming part of this) and even though I'm going to cringe, howl, and banshee wail at some of these which are sure to be awful, I'm excited about it. I applaud the ecclectic grouping of participating artists even as I shudder at the thought of Maroon 5 tackling a personal favorite, "I Shall Be Released" or Ke$ha and Miley Cyrus taking a shot at anything but I'm ready to fall in love with the amazing Bettye LaVette singing "Most Of The Time" or Diana Krall's "Simple Twist Of Fate." Mark Knopfler doesn't disappoint, ever. It will take restraint not to skip ahead to the end of the first disc to hear "Restless Farewell." Taj Mahal is mighty, Lucinda Williams brilliant. I want to hear their performances as well. I am also excited about hearing some artists whose names I know but work I don't. I've heard about bands like The Gaslight Anthem and artists like Raphael Saddiq. I want to hear what they come up with here and maybe it will nudge me to checking out more of their work. I've purchased the package (with this set and the I'm Not There soundtrack, I've got six discs of Dylan covers!) I've ripped the songs to my iPod. I'm going to listen to each and every one of them -- Miley and Ke$ha included -- and report back to you on the hits, misses, blahs, and in-betweens. It may take a minute but we're going to discuss these. Which of these are you most curious about? Which are you most afraid of? Let's compare before-and-after notes.